Once again it’s a compelling original painting from local artist, author and songwriter Dennis McGregor. In this year’s poster, Dennis painted “a nod” to “song camp”. On these crystal, spring-fed waters a solitary figure pauses from life’s routine and basks in a moment of inspiration. The canoe isn’t moving, but it’s definitely going somewhere. Ask any of the hundreds of song-campers whose lives have experienced the ripple effect! 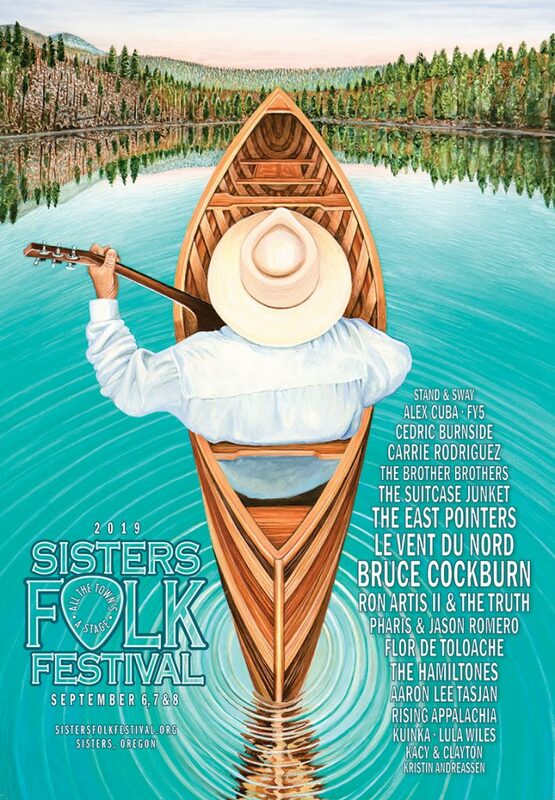 The image of a person in a canoe on a lake conjures up simpler times of reflection and inspiration, similar to what folks experience at the Americana Song Academy held at Caldera each year, the week before the festival. The final poster will have all 40+ acts.